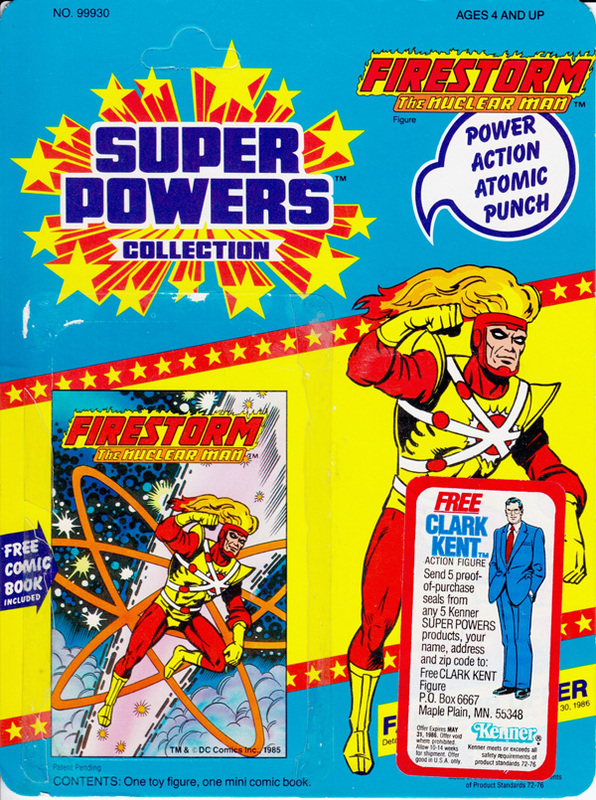 I’m very pleased to present the Super Powers Collection action figure card from Firestorm! While I still have the toy itself, my particular card has been lost to history. My thanks to you FIRESTORM FAN readers for sending images of your own cards! Man, this thing brings back memories! Check out the mail-away Clark Kent offer! Dude, I remember staring at the action figures on the back, wishing and hoping to own them all someday. 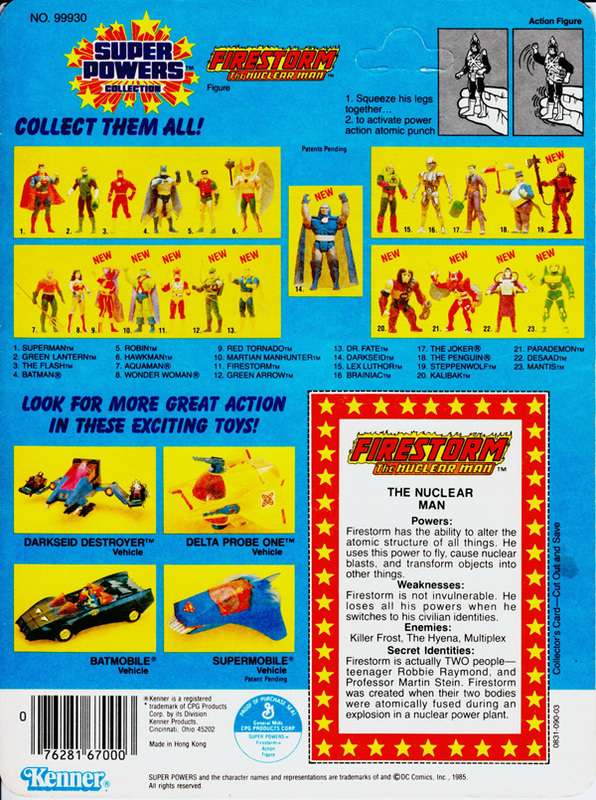 The Collector’s Card featuring the details on Firestorm was such a font of information for kids! This card is a wonderful piece of Firestorm memorabilia that I’ve never featured before! For my coverage of the Firestorm Super Powers action figure, please click here. For my coverage of the Firestorm Super Powers mini-comic, please click here. A couple weeks ago I asked you match-heads to send in scans of this action figure card. My thanks to JLAsuperdude and Jon from the Fizzit blog for sending images of their cards! Much appreciated guys! Posted in: Firestorm #01: Original (Ronnie/Martin), Super Powers Collection, Toys. I sort of love that not being invulnerable is considered a weakness. Sweet! Let’s see… my guy’s card listed Commander Blanx and Mr. V as Enemies, and yours has Killer Frost, the Hyena and Multiplex. I’ll have to remember that the next time I mock the Chernobyl Charnel House, because your three cold smoke my two. Do get to work on a better title for the rogues gallery, though. Nuclear Nemeses? Fallout Foes? HAHHA that’s pretty funny. I’ve never noticed that it said “Robbie”. ROBBIE Raymond?!?!? I never noticed that as a kid, and certainly didn’t notice it as I posted this image. I don’t really remember the packaging, probably because I tore it open to get at the figure and to test out its action feature. This was the line that still makes me nostalgic about action figures to this day – and I’m 35! I was never a big fan of Red Tornado, but I loved pumping his arms to make his legs spin! Obviously the blurb writers weren’t exactly fanboys. He can alter the atomic structure of all things? His limitation that restricted the transmutation powers to non-organic material was always in effect (excluding the elemental phase), wasn’t it?